Nohn, a nurse clinical supervisor, spends 80% of her time in the field providing hands on mentorship and supervision to CHWs. 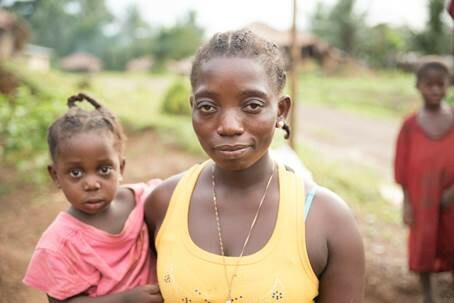 In a rural community in the dense rainforest of Liberia’s Rivercess County, a young mother named Odell exchanges conversation and words of comfort with a pregnant woman who has come to her for advice. The woman describes to Odell that she is suffering from “shivers”, and Odell recognizes this as a symptom of potentially serious complications affecting her pregnancy. 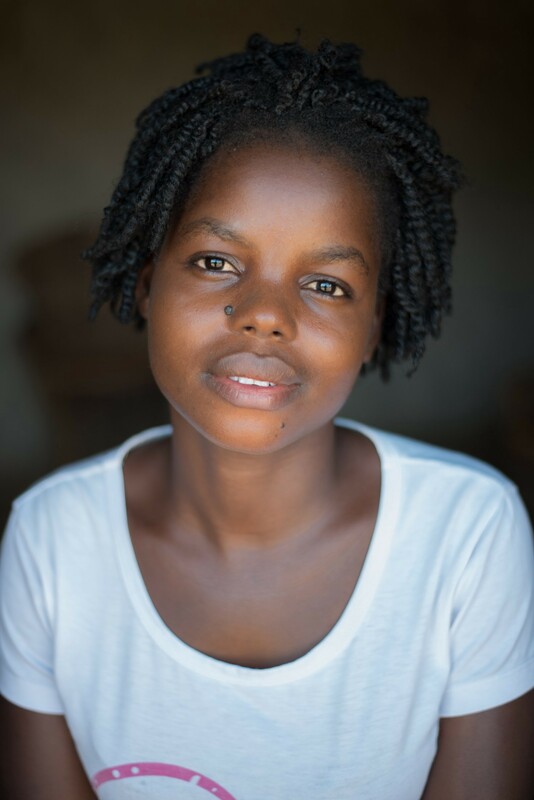 A well-respected member of her community, Odell was nominated by her neighbors to undergo training to become the community’s professional community health worker (CHW) under a government program called the National Community Health Assistant (CHA) Program. Thanks to her rigorous training and the assistance of job aide tools that help guide her through health service delivery, Odell is able to recognize that her patient is experiencing unusual and potentially dangerous symptoms. Following her training, she immediately refers the woman to the nearest clinic for more advanced care. Despite Rivercess County being a remote county 10 hours from the nation’s capital with limited infrastructure, telecommunications, and no paved roads, Odell, along with her nurse supervisor, has brought healthcare to this community and connected it to the government’s primary health care system. Odell, a CHW in Liberia’s National Program serves her neighbors by providing primary health care services in the community. A winding dirt road connects the community to the nearby clinic, which is staffed by nurses like Nohn Korto, who serves as Odell’s clinical supervisor. The community clinic is a critical link in the National CHA Program’s care pathway, as nurses receive and care for patients that CHWs refer when cases are too complex to address at the community level. Equipped with lifesaving diagnostic tools and drugs, the clinic staff is able to diagnose and care for Odell’s patient, then send her back home. Nohn provides Odell with follow up instructions to continue monitoring the woman in the community and check for signs of further complications. Following treatment, the woman has a healthy pregnancy and delivers a healthy, thriving baby. Reflecting on this referral, Nohn says she is proud of the knowledge and skill that Odell exhibited. As a clinical supervisor under the Liberia’s national program, Nohn travels to rural communities to mentor and coach CHWs like Odell who are providing lifesaving diagnosis, treatment, and referral services to their neighbors in some of the world’s most remote communities. Nohn and over 400 clinical supervisors like her ensure that Liberia’s CHWs have the mentorship, support, and critical supplies that they need to provide high-quality, community-based health services to populations who would otherwise have to walk for hours or even days to reach the nearest clinic for basic health services. Savior, a Quality Training and Management Advisor, provides refresher training and engages Odell in role play on family planning counseling. As the global community gears up for the 40th anniversary of the International Conference on Primary Health Care (PHC) at Alma Ata, which was the first conference to identify PHC as critical for achieving Universal Health Coverage (UHC), CHW programs are once again gaining visibility as valuable platforms for delivering PHC services to remote and rural communities. In order to realize Sustainable Development Goal (SDG) 3.8 — achieving UHC — this momentum must be matched with investments in community health program quality. While the global community has learned hard lessons over the past 40 years about the challenges of implementing high quality primary health care programs at the community level, the inspiring work of Nohn and Odell illustrates the power and potential of CHW programs that are characterized by strong supervision and integration into the broader public sector health system. Decades of evidence have confirmed that supervision is critical to program quality and CHW motivation. A systemic review across 16 low- and middle-income countries found “the most frequently cited enabling factor in the program design and management category was consistent management and supervision of CHWs.” Regular, field-based clinical supervision, which is the backbone of Liberia’s CHW program, was a critical determinant of success among a diverse set of geographies across Africa and Asia. Conversely, weak management and supervision structures, where supervisors were not attuned to community health programs or adult learning, created barriers to program scale and success. A systemic analysis on the effectiveness of CHWs in treating malaria also found that poor supervision decreased CHW confidence, connection to facilities, and overall program success in several different countries. 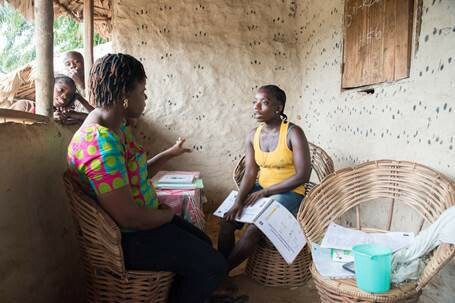 Given the importance of supervision in strengthening CHW performance and integration of community health programs in the formal PHC system, current CHW programs like those in Liberia focus increasing attention to this crucial layer of the system. 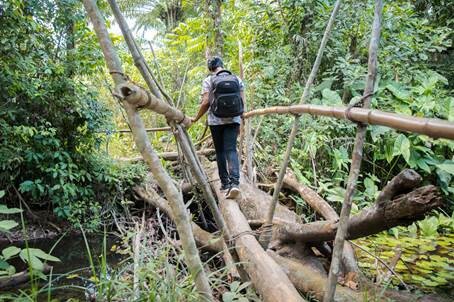 Siah, a clinical supervisor makes the long journey through Liberia’s rainforest on foot to provide in person mentorship and supervision to CHWs. In Liberia’s national program, clinical supervisors like Nohn spend 80 percent of their time traveling by foot, on motorbike, and in canoes to provide monthly, field-based supervision, coaching, and restock to CHWs right in their own homes. Clinical supervisors support CHWs like Odell to master clinical skills like performing a rapid diagnostic test for malaria, using mid-upper arm circumference measurement to screen children for malnutrition, and delivering the correct dose of lifesaving medication. This supervision includes random patient audits to monitor CHWs’ diagnostic and treatment accuracy. Receiving this type of support from Nohn ensured that Odell was able not only to recognize early on that her patient was suffering from a potentially serious condition, but also to understand the importance of quickly referring the woman to the nearest clinic to connect her to the broader primary health care system. Supervisors are identified for their leadership skills and are trained to provide supportive supervision to empower CHWs to identify areas for improvement and strengthen their skills sets. Liberia’s CHWs, supported regularly by motivated and trained clinical supervisors, have demonstrated the ability to provide patients at the last mile with high-quality care by extending the reach of an integrated health system. As the world prepares for new commitments to advance universal health coverage at the UN General Assembly and Alma Ata 40th anniversary this fall, we must move beyond nominal extension of primary health service delivery in rural communities and invest in CHW programs with strong supervision structures to ensure quality across the continuum of care. Community Health Impact Coalition. Practitioner Expertise to Optimize Community Health Systems. 2017. Pallas SW, et al. Community health workers in low-and middle-income countries: what do we know about scaling up and sustainability? Am J Public Health. 2013;103(7):e74–e82. doi: 10.2105/AJPH.2012.301102. Working to increase the recognition and support for Primary Health Care (PHC) in the global arena. Join the conversation bridging vertical delivery approaches to health and primary health care.